In talking to friends about aromatherapy and essential oils, I noticed something very interesting. Not everybody has a complete picture of the benefits of essential oils. Most people’s idea of the benefits of aromatherapy and essential oils is typically restricted to just one aspect. While some have experienced or at least heard about the benefits of essential oils for physical health, they were surprised to hear that essential oils can also be used for mental well being and for healthier skin and hair. Still others knew about using essentials oils as a disinfectant but did not know it could also be used as an insect repellant. So they were all a little right and a little wrong. The truth is, you can use essential oils to empower almost every area of your life. 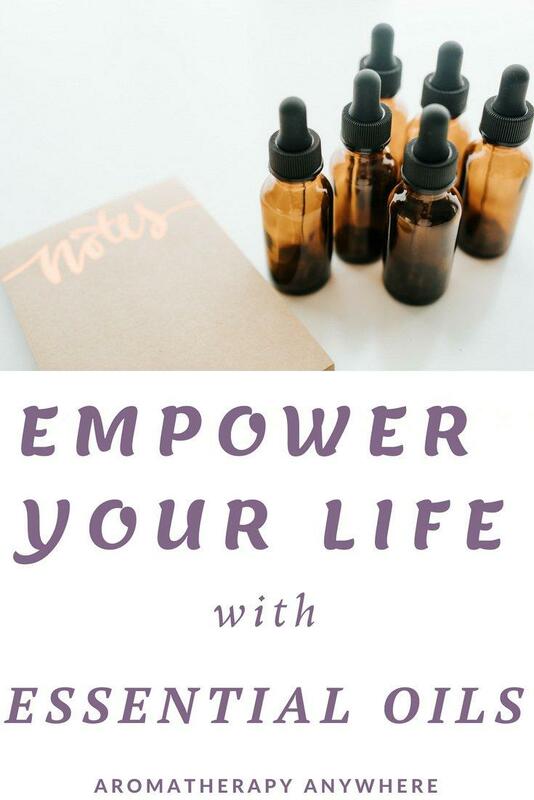 It’s impossible to cover ALL the ways essential oils can benefit you but here’s a bird’s eye view of how you can empower different areas of your life using essential oils. Essential oils have long been used to treat a wide range of medical conditions, both in mainstream medicine as well as alternative therapy. Take a look at how you can use essential oils to treat or manage some of the more common health complaints. Headaches: Headaches can be treated topically with lavender oil or peppermint oil, either on their own or blended together. Just rub the individual oil or the blend on your temples, or around the headache area. Putting a few drops of peppermint or lavender essential oil in a diffuser is very effective for managing tension and stress headaches. Sinus symptoms: A few drops of eucalyptus essential oil in a bowl of steaming hot water is a fastest and most effective remedy for sinus relief, and for treating a blocked nose. Create a tent and inhale the eucalyptus-infused steam for clearing your nose and throat. Interestingly, a lot of your favorite sinus relief medications already contain eucalyptus essential oil. Infections: Topical application of tea tree oil is amazing for preventing or treating all kinds of skin infections, from acne, cuts, and scrapes, to a swollen hangnail, or an oozing wound. If using as prevention, it is better to mix a few drops of the oil with warm water for a soak. This will prevent your skin from drying. If using as a treatment for an infection that’s already established, put a few drops directly on the infection three times a day. Muscular pain: Black pepper, marjoram, peppermint, and cypress essential oil are very effective for treating muscular pain. Mix a few drops of any one of these oils with plenty of coconut oil, and massage the area thoroughly before resting the muscle. Internal pain: To treat non-muscular internal pain, mix basil, sage, and rosemary oil in equal proportions. Rub this blend deep into the area before applying a warm wet towel or a hot water bottle over the area to helps the oils seep deeper into the tissues. Soaking in a tub of warm water will also help the oils seep deeper. Sore Skin: If you have sore skin due to dry skin, eczema, swelling or any other skin condition, use a combination of lavender oil and peppermint oil with Epsom salts as a warm soak. Follow this with a liberal application of a moisturizer made of lavender oil and shea butter immediately afterward. Stress is becoming increasingly more prevalent today, leading to several other issues. Fortunately, there are many types of essential oil treatment that can help you manage stress and discomfort, whether you live with it every day as a part of mental illness or whether it is just a temporary problem caused by your situation. Low Mood: Rose essential oil works really well to boost your mood. Apply it to your neck, temples, and hands for a sense of peace and serenity. Soaking in a warm bath with a heavy dose of rose oil and peppermint is known to help reinvigorate and elevate your mood. Another little trick to create a positive environment is to add an essential oil that reminds you of happy times. pssst… Rose essential oil is also the reigning aphrodisiac essential oil. Anxiety: To manage or reduce anxiety, combine chamomile, lavender, and peppermint essential oils and rub into your hands, temples, and the back of your neck. You can also mix them in your bath with some Epsom salts, or use food-grade oils in a mild warm tea to help calm your nerves. If you are using meditation to handle your anxiety, use cloves, orange, and sandalwood for energy and serenity. Better Sleep: For better sleep, use lavender oil as a part of aromatherapy. Sprinkle some drops on your pillow, put some in a reed diffuser, or even use a lavender oil steam session before bed to help yourself relax. You can even put a few drops of lavender behind your ears, and under your nose to ease the underlying tensions that lead to insomnia. More essential oils that are good for sleep. Essential oils are used in a wide range of beauty treatments, particularly because they are so effective at fighting the signs of aging and ill health. Acne: To calm acne breakouts, make a sugar scrub with Manuka honey, tea tree oil, and granulated sugar. Rub it gently onto your face and use circular motions. Rinse off. Use daily. This sugar scrub fights the infection and cleanses the pores. Cellulite: For cellulite, harness the powers of grapefruit. Put a few drops of grapefruit essential oil into a tablespoon of virgin coconut oil and massage into the areas twice daily. It will not get rid of it, but it will reduce the appearance of them. If you want to fight stretch marks and skin sag too, add frankincense and myrrh to the mix. Consider using cocoa butter instead of coconut oil for sensitive skin. Natural Hair Care: To thicken hair, add rosemary essential oil to your shampoo, or make a shampoo of your own with coconut milk, lavender, rosemary, and some aloe vera gel or rosewater. This should strengthen and thicken your hair. For greasy hair or persistent dandruff end your shower by rinsing your hair in water with a few drops of tea tree oil in it. Dry Hair: For treat dry hair, put a teaspoon of rosewood oil, two drops of sandalwood oil and three of lavender into almond oil, cocoa butter, or shea butter. Massage the mixture to warm it before applying to your hair and allowing to soak in for 20-60 minutes before rinsing. Use two tablespoons of the mixture and comb through the hair for a stay-in conditioner for textured hair. Age Spots: To get rid of age spots, sun spots, and dark circles, mix a drop of frankincense essential oil with a small amount of pure virgin coconut oil and apply on the blemishes every morning and night to slowly fade them. But always watch any marks on your skin in case they seem abnormal. If they grow, talk to your doctor. Cracked Skin: To soften dry, cracked skin on your feet or hands, mix lavender oil into pure virgin coconut oil and massage deeply into your skin every night. Use food grade lavender oil in coconut oil to make a healthy lip balm too. Bad odors are more than just irritating or unpleasant. They are often indicative of stale air, illness, and bacteria. When your rooms smell bad, don’t just spray an air freshener to mask the smell. Address the root cause of the problem. Many essential oils are antibacterial and balancing and can be used to freshen up carpets, curtains, and beds. Put a few drops of any of these top antibacterial essential oils in a spray bottle. Fill the bottle with water to dilute the oil. Shake the bottle to split up the droplets of oil. What you have is a bottle of all-natural, non-toxic solution that is effective for misting large areas with an essential oil. Spraying this diluted blend on your upholstery and furniture will help kill excessive dust mites, reduce the number of harmful bacteria around you and also make the room smell a lot nicer. Most essential oils can be used around the house, but make sure to check in advance before applying any to wood or fabric. Some essential oils will stain, bleach, or damage fabrics and woods. If there is no information and you are not sure, test a tiny drop of the pure oil somewhere inconspicuous and see if it damages the furniture. If not, you’re good to go! Essential oils are amazing for around the house. They form the base of a lot of natural home cleaning products. Once you know how to make your own, you may never go back to conventional household poisons and detergents. To clean crusty burn marks from pans, stoves, and ovens use a combination of boiling water and lemon essential oil. You can either mix them directly or apply the lemon first, let it soak, then use the scalding water to rinse. Sometimes two treatments are needed, but after this, the crust lifts off. To stop cats and dogs from chewing your sofa and shoes, nothing beats tea tree oil. Other than the occasional weird dog that loves it, the vast majority of dogs and cats hate the taste and will not chew or even scratch or be near something that has been sprayed with tea tree oil. To keep rodents and spiders at bay, make use of their natural aversion to peppermint. Use peppermint essential oil in a spray bottle and spray any areas where rodents or spiders get into the house, as well as around door frames and skirting boards. You can even use reed diffusers in key locations to keep your home pest free! When it comes to carpets and upholstery that you cannot take the covers off and throw in the laundry, sometimes it can feel like a nightmare trying to clean them. But rather than turn to artificial solutions, try mixing baking soda and your own essential oil blend, for a natural carpet freshening powder. Just shake it into your carpet and onto your furniture, use a brush to rub it firmly in, leave it an hour, then vacuum it back out. While there are many ways you can empower your life with essential oils, buying so many different oils individually can turn out to be very expensive. If you have decided to use aromatherapy and essential oils to empower different areas of your life, you are better off buying a set of essential oils. The Top 32 Essential Oils Set at Plant Therapy . As an additional bonus Get FREE Shipping & FREE Returns on Every Order at Plant Therapy – Shop Now! Plant Therapy’s starter set is another great buy. It includes 6 of their top selling single oils, 2 carrier oils, 4 roller ball bottles, and 4 inhalers. Radha Beauty Essential Oils Set of 18 Essential Oils. Read my Radha Beauty Essential Oil Set Review.